The A. Johnson Co., LLC is a family-owned and operated forest products business producing high quality hardwood lumber for both the wholesale and retail markets. Hard maple is slightly more than half of production followed by red oak, soft maple, ash, yellow birch, and various other species. 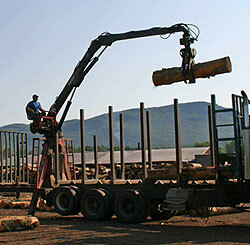 We also produce white pine lumber for our retail sales operation. Located in Bristol, VT in the western-central part of Vermont in the foothills of the Green Mountains and at the edge of the Champlain Valley, we have access to some of the finest hard maple timberland in the world. Our manufacturing process is focused on producing lumber that is well manufactured and dried to high standards. Our sales staff ensures that the lumber is carefully graded and works closely with our customers so they receive the best quality lumber and the product that will work best for them. 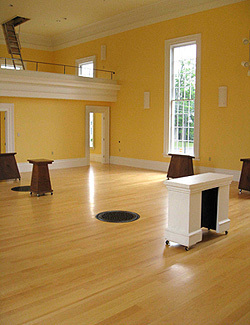 Our retail business sells high quality hardwoods, as both rough and finished into flooring and paneling, as well as white pine from our timberlands in rough and finished form. Two full-time sales people serve the needs of our retail customers. We are committed to sustainable timberland management, the production of quality lumber in a safe working environment, and being responsible and engaged citizens of our community. Retail sales serving 50 mile radius. Wholesale sales worldwide. We're open Monday through Friday from 7:00am to 4:30pm. If you are going to buy a large quantity or know you will take a while to look around, please come in by 4:00 so we can all go home by 4:30.